Campers for both showcases that are participating overnight will dormed in the South Dorm Complex on the UConn Storrs campus. The exact dorms for each showcase will be named at a later date. Day campers will be dropped off at Mark Edward Freitas rink and pick up will be at the rink or the dining hall. Addresses and locations will be provided for the dining hall once confirmed. South Dorm Complex - S- Lot is where drop off will be at the back of the complex. S-Lot GPS address is 830 Bolton Rd. Storrs, CT. This S-LOT is just past or before the School of Fine Arts depending on which way you are coming from. 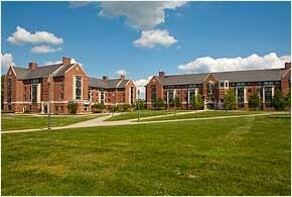 Both the Prep Showcase and the College ID Showcases will be dormed at UConn's Storrs campus in the South Dorm Complex. Overnight campers will check-in at the dorm, drop their overnight bag, and then continue on to the rink with their hockey gear. The drop off area for the South Dorm complex will be the "S" parking lot. There is no exact GPS address for the "S" parking lot, but it is right beyond the buliding address for UConn's School of Fine Arts. Use that GPS address instead: 830 Bolton Rd. Storrs, CT. The S Lot is located right next to the School of Fine Arts. We will have hockey staff at the corner of Bolton Rd. and the S-Lot to help you find your way. At light turn right onto Storrs Rd. Take third right onto Separatist Rd. Take first right onto Jim Calhoun Way. Rink is on the right. Take footpath/sidewalk at the NW corner of S Lot - there is a volleyball court to the left of the entrance; Rome Commons and South Residences will be on the left and right. Take a left onto Jim Calhoun Way. About .4 mile the Rink is on the left, after football buildings, soccer field, baseball field. Take a left at the light onto 275/South Eagleville Rd. (Post Office is on right). Take the 3rd right onto Separatist Road. Take the first right onto Jim Calhoun Way. 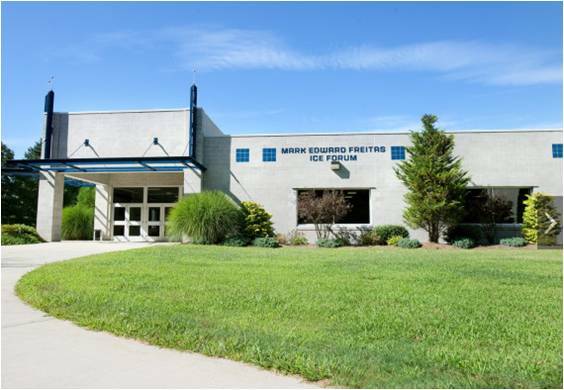 The rink is on the right. Take a right onto 275. Just over a mile down the road take a left onto Separatist Road. Take Exit 68 from 84 East (Coming from Hartford) take a right off the ramp that will put you on 195. Take Exit 68 from 84 West (Coming from Boston) take a left off the ramp that will put you on 195. Follow 195 for seven miles. After you enter campus, take right at light onto N. Eagleville Rd. Take a quick first left onto Glenbrook Rd. Turn left at the end of Glenbrook onto Hillside Rd. Turn right onto Jim Calhoun Way after the basketball stadium. Follow Jim Calhoun Way through fields and rink will be on the left. Take a left onto Rte. 195, then take a right onto Rte. 275. After going through campus, Take the 3rd right onto Separatist Rd. The drop off location for the South Dorm Complex will be the "S" parking lot behind the dorm complex. Use that GPS address instead: 830 Bolton Rd. Storrs, CT. (The S-LOT is right after or before UConn's School of Fine Arts depending on which way you are coming into campus). Follow 195 for seven miles. You will come up to University on left. Keep going. Take right onto Bolton Rd. after you go by a bit of the campus. Look for S LOT Parking on your right after the UConn School of Fine Arts. Pull into S LOT Parking. Look for Snow Dorm (for Prep Showcase) and Snow Dorm also (for College ID Showcase). Take a left onto Westwood Rd. Follow it to end and veer left (turns into Hillside Circle) then quick right onto Bolton Rd. Follow Rt 44 West until Rte 195 (Storrs Rd) in Storrs/Mansfield CT.
Take right onto 195 and follow for seven miles. Pass the campus on the right and look for Bolton Rd. on the right.